The spectacular cliff-bound country that jumps up from Sydney's back doorstep is the most popular and beloved part of the Greater Blue Mountains - and for good reason. Wild rivers and creeks cutting into the eastern fall of the Great Divide have carved this big and broken landscape of ochre-coloured clifflines, distant blue ridges, deep valleys and canyons. The central Blue Mountains have enthralled generations of visitors with vast forest vistas, ferny glens, waterfalls, limestone caves and historic places, as well as the many edge-of-the-world lookouts, winding bush tracks and accommodation houses that make exploration so easy. The first inhabitants of this country of the Coxs and Grose Rivers were the Darug, the Gundungurra and the Wiradjuri people. Local Aboriginal people maintain close ties to the land, its stories and a heritage of hundreds of rock art and occupation sites protected by trackless bushland. But to the early white colonists, the mountains west of Sydney were a strange land, a mystery and a barrier. In 1813, Blaxland, Wentworth and Lawson, following an ancient Aboriginal trading route, found a way through the rugged escarpment and beyond to the high country of the Central Tablelands. Their route was quickly transformed into the first road over the mountains, opening inland New South Wales to wider settlement. Today's Great Western Highway still follows the same path along the ridgeline dividing the valleys of the Grose and Coxs-Nepean Rivers. The Bells Line of Road (also The Botanists Way) follows another traditional Aboriginal route along the northern edge of the Grose Valley. These two highways and the western railway, together with the roads that lead further west into the tablelands around Lithgow and Oberon, provide easy access to a wealth of experiences and attractions. As if the feast of World Heritage wilderness, lookouts and walking tracks weren't enough, there's also a vibrant community of artists and galleries, a string of interesting villages, every sort of accommodation and dining experience, beautiful gardens, a rich collection of Aboriginal and historic heritage, recreational waterways and lovely countryside. The Greater Blue Mountains Drive links all these attractions together for your exploring pleasure. When colonists first breached the 'sandstone barrier' of the mountains, they passed over the ragged country and poor soils as unsuitable for grazing or crops. But then the beauty of the region began to take hold. Enthusiasts were soon calling for permanent protection of the natural wonders. In an early act of vision, Fish River (now Jenolan) Caves were 'reserved from sale' in 1866, then the upper Grose Valley in 1875. But it wasn't until 1959, after a thirty-year campaign by pioneer conservationists, that the first national park was created. That kernel of Blue Mountains National Park has continued to grow until a million hectares of protected land was placed on the World Heritage list in the year 2000. Today, the northern part of Blue Mountains National Park and Jenolan Karst Conservation Reserve make up the central Kedumba sector of the Greater Blue Mountains World Heritage Area. Kedumba is the valley south of Katoomba, and a variation on the same Gundungurra word as the town. Heading west from Penrith into the mountains, the highway slowly climbs higher, past many villages with their own local walking tracks. The landscape is at first subdued and gentle, but soon reaches another level of grandeur. The major landforms of the upper mountains are the stupendous valleys, where the sandstone plateau falls away on either side of the central east-west ridge into great shale gulfs filled with lush forests. The Grose Valley, much of it wilderness, lies north of the central ridge to the Bell Range. Beyond, the north side of Bell Range falls to the wilderness labyrinth of the Colo River catchment. The southern side of the central ridge drops into the Megalong, Kedumba and Jamison valleys of the Coxs River catchment. Further south lie the steep ridges of the Kanangra-Boyd Wilderness, made of much older rocks that have been and folded and changed by heat and pressure. The valley edges of the upper Blue Mountains are dramatic yet accessible, with cliff-top lookouts hovering over blue-green forest deeps. Networks of walking tracks wind up and down through cliffs, waterfalls, heathland, bush and rainforest. 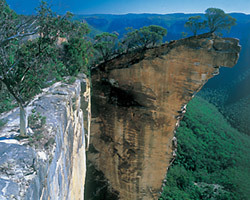 Major centres for access into the national park include Wentworth Falls, Leura, Katoomba and Blackheath. Heading west again on either the Great Western Highway or Bells Line of Road (The Botanists Way) takes you out of the bushland into the rolling grazing country of the Central Tablelands. The main centres of Lithgow and Oberon have their own cultural, rural and heritage delights, as well as being gateways for whole new landscapes of the World Heritage Area. Out of Lithgow you can explore remarkable sandstone formations, silent guardians of the largest wilderness in New South Wales. Gardens of Stone and Wollemi National Parks form part of the northern Monundilla sector of the World Heritage Area. Newnes Plateau and the Wolgan Valley hold intriguing relics of the oil shale industry, while around Lithgow itself you can discover a rich industrial and railway heritage. Oberon sits astride the Great Divide as the gateway to both Jenolan Caves and the southern Colong sector of the World Heritage Area. Kanangra Walls in Kanangra-Boyd National Park is a must-see lookout over a deep wilderness gorge and endless blue ridges. You can camp in montane forest at Boyd River on the way there. At Jenolan you can marvel at some of the oldest and best decorated limestone caves in the underworld. Guided and self-guided underground tours are available every day, while above-ground walking tracks explore the karst landscape. With a range of accommodation it's easy to spend all the time you'll need. Further afield, adventurous travellers will enjoy the long drive to Yerranderie, an historic mining village deep in the heart of very remote country.